Do you want to create nicely designed and coordinated marketing materials, such as business cards, trifold brochures, promotional postcards, coupons and so forth? Quark (the folks behind respected professional desktop publishing program QuarkXpress) has a new, free template design software/service combo called Quark Promote. 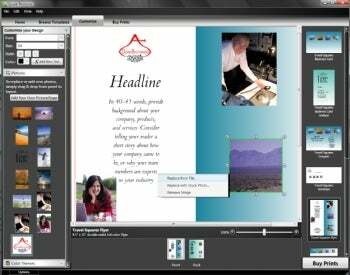 Quark Promote is free software with attractive, customizable print templates for creating and ordering coordinated promotional material, such as business cards, flyers, coupons, postcards, etc. When you download Quark Promote software, you're immediately taken to links for matched sets of templates. Current templates are divided into 17 industry categories, such as Accounting, Auto Repair, Carpet Cleaning, Dentistry, Spa, Veterinary, and the generic All Purpose. Quark promises that they'll have thousands of templates in dozens of categories by next year. The templates that you select and edit are saved locally on your computer. Quark Promote's templates are very nicely designed and are very customizable. You can easily replace pictures with supplied free stock photos (which tend to be a cut above average) or your own pictures. You can also add your logo, replace the placeholder text with your own copy (by typing or using copy/paste), move elements around, add or delete others, and choose a different color scheme. This doesn't mean that Quark Promote has every design feature you might want. You can't create your own color schemes (although Quark says they will add a color picker in the future). Nor is there a text wrap option for shaping text around a photo or logo. Much more irritating is the fact that once we customized a trifold brochure by replacing photos, putting our logo, and adding our address, phone number and Website, those changes weren't reflected in the other templates in the group--such as the business card and postcard. At the very least, our logo should have been populated throughout the templates. Quark says that they designed the software this way, to give users flexibility, but it seems to us that it's just creating extra work for users. The whole purpose of the Quark Promote software is to create documents that can be sent to a print shop. In fact, that's how Quark makes their money--as a percentage of print sales. So, the only output you can get from your own desktop devices are proofs that have "Test Print" scrawled across them. Instead, when you've finished your design, the final stage is to order your prints from one of the shops (independents as well as big chains) that has signed onto the Quark Promote service. You have a choice between ordering by mail or finding a neighborhood printer (by searching on your zip code) where you can pick up your documents. Depending on whether or not you order a proof, your order should be ready in about one to three days. Quark says that they have 35 print shops on board at the time of this writing, and that they expect to have about 125 by the end of the year and 1,500 by the end of next year. The franchises that are currently signed up are: Allegra Networks, AlphaGraphics, PIP Printing, Signal Graphics, and Sir Speedy. One of the major advantages over competitors such as VistaPrint is that Quark Promote controls the color management of your files and checks your files to make sure everything is high enough resolution, to assure better and more predictable print results. Quark Promote is very new and not full-featured at present. But as they add templates and more controls (such as customizable color schemes), we expect that it will live up to its legacy, delivering tools you can use to design and order high quality print materials. They even promised us that they would look into being able to automatically populate a logo throughout a template set.